First pints of Tristan 'Island Brew' were pulled at the Great British Beer Festival held at Olympia London on Tuesday 11th August 2015. 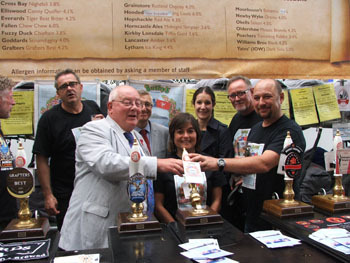 Photos from Jim Kerr show: Above Left: Dawn Repetto pulling a pint with behind, her husband Robin, Bushy's Manager Martin Brunnschweiler and Tristan Government UK Adviser Jim Kerr. Above right and below left: Dawn pulling the perfect pint; Below right: Robin has a go. 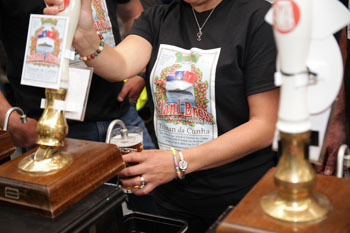 The queues of hundreds of people outside London's Olympia Exhibition Venue for the first day of the Great British Beer Festival should have been the clue – that the first Tristan da Cunha beer would be a sell-out success. It had been picked by The Guardian newspaper as a prime example of the revolution sweeping the British brewing industry – whereby the public is said to be deserting mass-produced, fizzy lagers, in favour of individually crafted beers from small independent brewers, who are ever more inventive with their ingredients. "A beer made from one of the world’s rarest ingredients, and picked on one its most remote corners, is to make its début at the Great British Beer Festival this week – with ambassadors from the island on hand to pull the first pint. 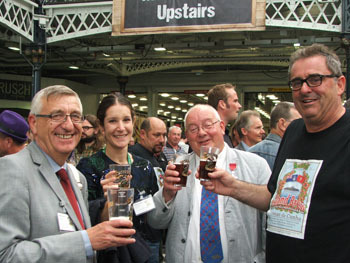 Island Brew, which is brewed from redcurrant-like Empetrum rubrum berries, is one of hundreds of beers jostling to challenge the taste buds of thousands of aficionados attending the festival in London, now in its 38th year. The varied offerings this year reflect the scale of the craft beer revolution sweeping the UK". 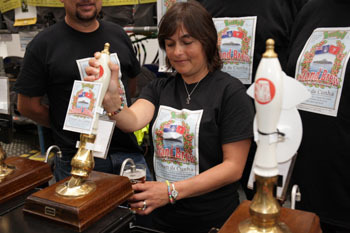 "Island Brew"is brewed on the Isle of Man by Bushy's Brewery in accordance with the Manx Pure Beer Act of 1874 which enables rubrum berries, hand-picked on Tristan, to be added, creating a unique, refreshing beer that in the words of Tristan's Tourism Development Officer, Dawn Repetto, is "absolutely delicious". 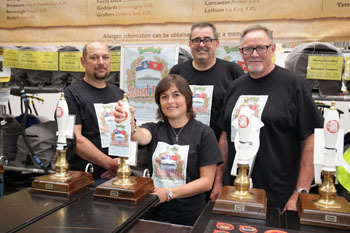 Bushy's brewer, Curly Convery, perfected infusing the Tristan berries in to what Bushy's advertisement in the Beer Festival's programme calls "a sympathetically complimentary 4.5% ABV brew" and CAMRA agreed for the first pint to be pulled by Dawn, Robin and Chris in front of the media – and crowds of intrigued guests from the brewing and hospitality industries. She was joined by Martin Brunnschweiler; by Tristan Desk Officer Laura Benyohai and her colleague Simon Smith, Desk Officer for Prosperity in the Overseas Territories Department of the FCO; by Jim Kerr (former Tristan Education Adviser and now the Tristan Government's UK Adviser), with whom the family stayed in Norfolk after leaving the Isle of Man. UK Representative, Chris Carnegy, came up with with a unique sales ploy for the beer – each customer buying "Island Brew" is given a voucher for a free beer – but it can only be redeemed in the Albatross Bar before the end of 2017. Leaflets about Tristan were given out to customers. 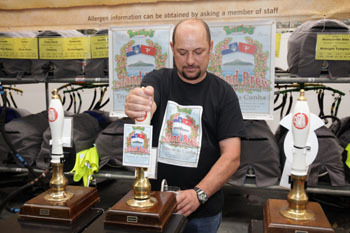 Martin Brunnschweiler, who plans to visit Tristan on board the RMS St Helena's final sailing in 2016, said: "Tristan da Cunha and the Isle of Man have joined forces in order to make beer lovers more aware of the remote British South Atlantic islands history, people and location, but to also enjoy a real tasty brew while doing so". News of the success of the launch was put out by the FCO via Twitter, Facebook and other media. 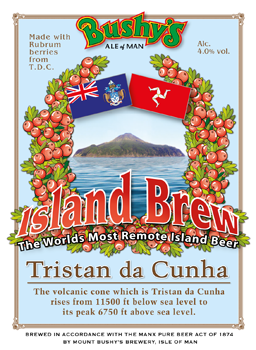 Now as Dawn, Robin and their children prepare to return to Tristan, they will carry with them brewing equipment supplied by Bushy's to take the project to its next level – beer brewed on Tristan da Cunha itself. Martin told the FCO Desk Officers that he and Dawn had ideas on how sales could be made to cruise ships, visitors, islanders and for export – creating a successful economic benefit for Tristan's economy, as those early discussions in Whitehall had envisaged. Meanwhile, all concerned are reflecting on the sell out success of "Island Brew" at the Festival and the orders lodged from other beer festivals and specialist outlets (being handled by wholesalers Flying Firkin) for the next batch. to Bushy's Isle of Man Brewery. to the Isle of Man May-August 2015.
by the end of 2017! Left: Trade visitors were invited to quiz the Tristan team about the island, while sampling "Island Brew": trying to respond to the torrent of questions from thirsty guests are (l-r) Martin Brunnschweiler, Former Tristan Government UK Representative Chris Bates, EU Prosperity Desk Officer Simon Smith, Dawn Repetto, FCO Tristan Desk Officer Laura Benyohai, Jim Kerr and Robin Repetto.